Diquat is a contact herbicide that produces desiccation and defoliation most often available as the dibromide, diquat dibromide. Brand names for this formulation include Aquacide, Dextrone, Preeglone, Deiquat, Spectracide, Detrone, Reglone, Reglon, Reglox, Tribune, Ortho-Diquat, Weedtrine-D, Weedol 2 and, in combination with glyphosate, Resolva. Diquat is a non-selective herbicide that acts quickly to damage only those parts of the plant to which it is applied. 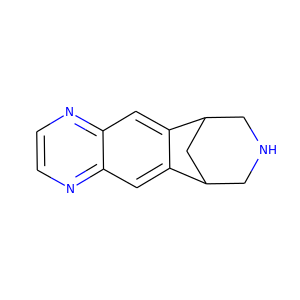 Asenapine, sold under the trade names Saphris and Sycrest, is an atypical antipsychotic developed for the treatment of schizophrenia and acute mania associated with bipolar disorder. 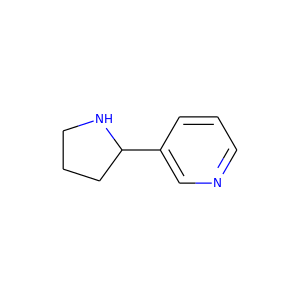 It was chemically derived via altering the chemical structure of the tetracyclic (atypical) antidepressant, mianserin. 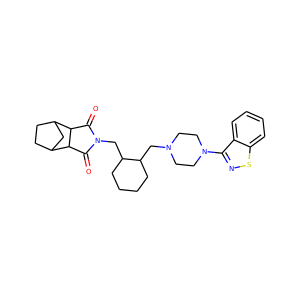 Lurasidone (trade name Latuda) is an atypical antipsychotic developed by Dainippon Sumitomo Pharma and marketed by Sunovion in the U.S. It has been an FDA approved treatment for schizophrenia since 2010 and for treating depressive episodes in adults with bipolar I disorder since 2013. It can be used alone or in combination with mood stabilizers such as lithium or valproate (e.g., Depakote). 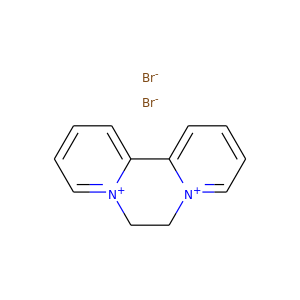 Propyleneimine (2-methylaziridine) is a toxic chemical compound. 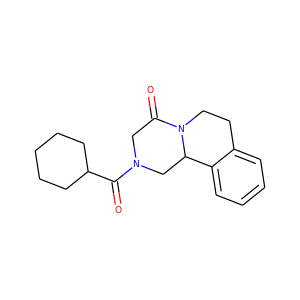 Varenicline (trade name Chantix and Champix), is a prescription medication used to treat nicotine addiction. It both reduces cravings for and decreases the pleasurable effects of cigarettes and other tobacco products. 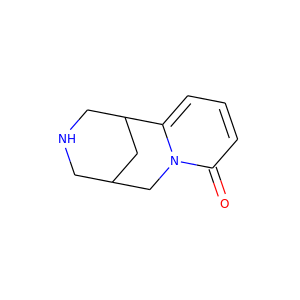 It is a high-affinity partial agonist for the α4β2 nicotinic acetylcholine receptor subtype (nACH) that leads to the release of dopamine in the nucleus accumbens when activated, and therefore, has the capacity to reduce the feelings of craving and withdrawal caused by smoking cessation. Cytisine, also known as baptitoxine and sophorine, is an alkaloid that occurs naturally in several plant genera, such as Laburnum and Cytisus of the family Fabaceae. It has been used medically to help with smoking cessation. 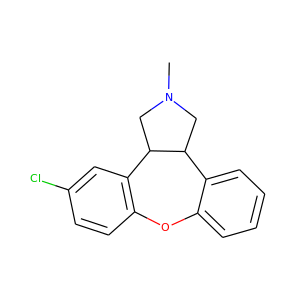 Its molecular structure has some similarity to that of nicotine and it has similar pharmacological effects. Lubiprostone (rINN, marketed under the trade name Amitiza among others) is a medication used in the management of chronic idiopathic constipation, predominantly irritable bowel syndrome-associated constipation in women and opioid-induced constipation. It was initially approved by the U.S. Food and Drug Administration (FDA) in 2006 and recommended for use in the by the National Institute for Health and Care Excellence (NICE) in 2014. 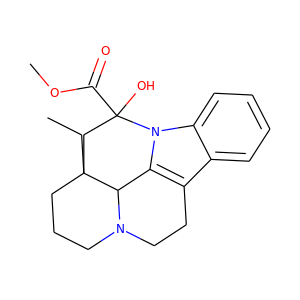 Protopine is a benzylisoquinoline alkaloid occurring in opium poppy, Corydalis tubers and other plants of the family papaveraceae, like Fumaria officinalis. 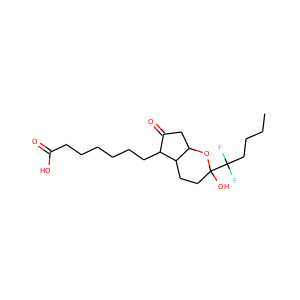 It has been found to inhibit histamine H1 receptors and platelet aggregation, and acts as an analgesic. Podophyllotoxin (PPT), also known as podofilox, is a medical cream that is used to treat genital warts and molluscum contagiosum. It is not recommended in HPV infections without external warts. It can be applied either by a healthcare provider or the person themselves. 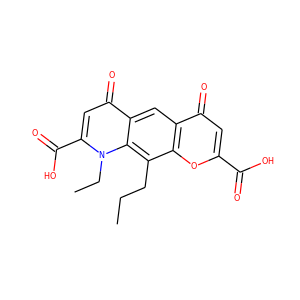 Vincamine is a monoterpenoid indole alkaloid found in the leaves of Vinca minor (lesser periwinkle), comprising about 25-65% of the indole alkaloids found in Vinca minor by weight. It can be synthesized from related alkaloids. 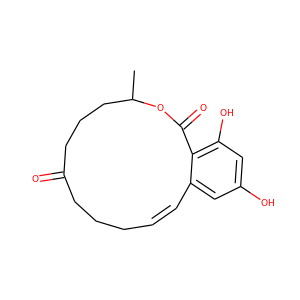 DABCO (1,4-diazabicyclo[2.2.2]octane) is an organic compound with the formula N2(C2H4)3. 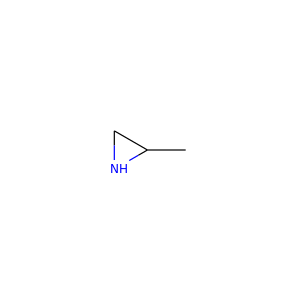 This colorless solid is a highly nucleophilic amine, which is used as a catalyst and reagent in polymerization and organic synthesis. 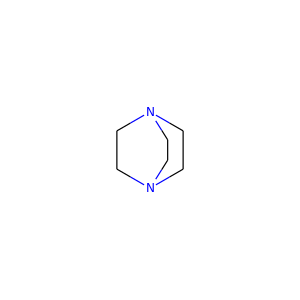 Quinuclidine has a similar structure, with one of the nitrogen atoms replaced by a carbon atom. 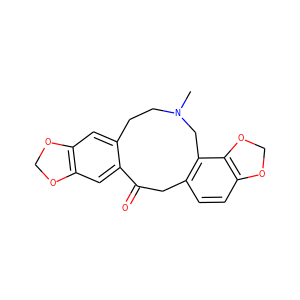 Zearalenone (ZEN), also known as RAL and F-2 mycotoxin, is a potent estrogenic metabolite produced by some Fusarium and Gibberella species. Particularly, is produced by Fusarium graminearum, Fusarium culmorum, Fusarium cerealis, Fusarium equiseti, Fusarium verticillioides, and Fusarium incarnatum. Several Fusarium species produce toxic substances of considerable concern to livestock and poultry producers, namely deoxynivalenol, T-2 toxin, HT-2 toxin, diacetoxyscirpenol (DAS) and zearalenone. 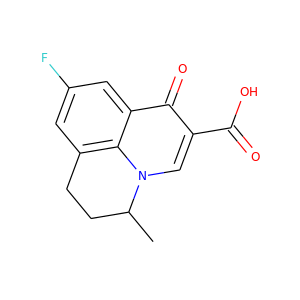 Flumequine is a synthetic fluoroquinolone antibiotic used to treat bacterial infections. It is a first-generation fluoroquinolone antibacterial that has been removed from clinical use and is no longer being marketed. It kills bacteria by interfering with the enzymes that cause DNA to unwind and duplicate. Praziquantel, sold under the brandname Biltricide among others, is a medication used to treat a number of types of parasitic worm infections. Specifically it is used for schistosomiasis, clonorchiasis, opisthorchiasis, tapeworm infections, cysticercosis, hydatid disease, and other fluke infections. It should not be used for worm infections of the eye. 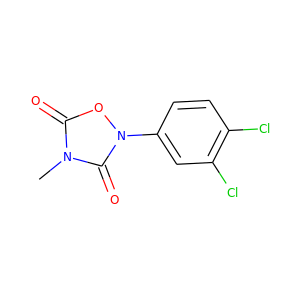 Methazole (C9H6Cl2N2O3) is a herbicide in the family of herbicides known as oxadiazolones. Nedocromil sodium is a medication considered as mast cell stabilizer which act to prevent wheezing, shortness of breath, and other breathing problems caused by asthma. It is administered by an inhaler under the brand name Tilade (although its effects in this form are far less than those in albuterol or other well-known inhaler medications) and as an eye drop under the brand name Alocril. Liquid preparations are available in the UK under the name Rapitil for use for allergic eye reactions. 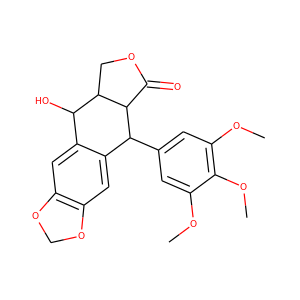 Nornicotine is an alkaloid found in various plants including Nicotiana, the tobacco plant. It is chemically similar to nicotine, but does not contain a methyl group. It is a precursor to the carcinogen N-nitrosonornicotine that is produced during the curing and processing of tobacco.